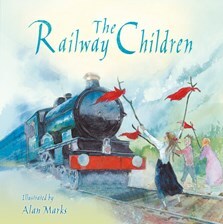 An evocative picture book based on the classic E. Nesbitt tale. When their father is wrongly accused of spying, Bobbie, Peter and Phylis move out of London and experience new exciting adventures in the countryside. But will their father ever return? Warmly illustrated in vivid watercolours. I love this book as it's really enjoyable because they stop a train from going over a tree stump. I am 7 and recommend this to everyone as I love reading this time after time.